One obvious allure of this Adirondack lifestyle is the natural visual beauty of the outdoors. That is, it is easier to look on the bright side of life when it surrounds you. The natural beauty of the Adirondacks has brightened many otherwise gray moments, and studies have shown the important therapeutic and healing effect of spending time in nature. I think that healing power is addictive, and alluring. It explains why, even in the middle of very busy and hectic lives, many people who live in the Adirondacks stop and go for a ski, a run or a walk in the woods. It is the reason I stopped all work on a very busy spring day last week and took a walk around the homestead property with my camera. The day started rainy and gray, which made working inside a tad more tolerable. But when a brisk breeze blew away the clouds to reveal a sparkling, Adirondack blue sky, it was over for the chores. Fortunately, springtime in the Adirondacks is best experienced up close. Instead of winter's impressive snow-capped mountain vistas, in the spring, one notices the smaller or more subtle things that make the Adirondacks so special. I say fortunately, because the lure of seeing something special and beautiful is another good reason (excuse?) to take the daily dose of outdoor medicine, and go outside and play. 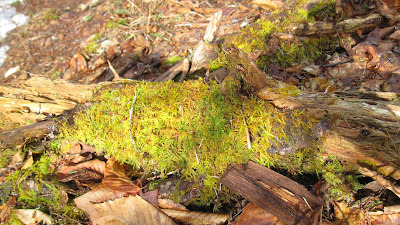 Today's featured photo of Adirondack springtime moss courtesy of Joann Sandone Reed.